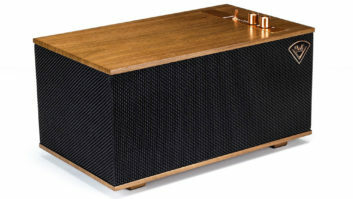 RIVA Audio's WAND Series of wireless multiroom audio players are now available for purchase. Rikki Farr knows how good music should sound, perhaps better than anyone else alive. As a club manager, concert and festival promoter, and music producer, he’s worked with almost every major artist of the past century: from the Beatles and Rolling Stones, to Led Zeppelin and the Who, to Stevie Wonder and Michael Jackson, to Pearl Jam and the Red Hot Chili Peppers. It’s probably easier to name the artists he hasn’t worked with. But he also has some 50 years of experience in designing audio products. And as founder and chief creative officer of RIVA Audio, his mission is simple: to enable as many people as possible hear great music as it was intended to sound. “That’s my dream,” he said, “to allow a new generation to experience music in its original form.” To that end, he and a team of engineers developed the WAND (Wireless Audio Network Design) Series of Hi-Res multiroom “+” wireless speakers, which is now available for purchase. Both models can deliver full-fidelity audio, up to 24-bit/192kHz, with output up to 100-plus decibels and a frequency range of 18kHz down to 55Hz for the smaller ARENA and 38Hz for the FESTIVAL. However, according to Farr and Donald North, RIVA president and chief engineer, the units can handle transient peaks, allowing them to “burst through without hitting the ceiling.” This ability, along with an EQ that subtly adjusts according to volume level, keeps the sound from becoming scratchy or boomy (the dreaded “elephant fart bass,” as Farr likes to say). From a custom integration standpoint, the WAND Series can also be used as a whole-home multiroom solution, with the ability to link 32 speakers to one master unit. Through Google Home, users can customize their speaker array into zones and groups, and give custom names to each unit. Retailing for $249, the ARENA features 50 watts of power driving three transducers and three passive radiators. Each unit presents a wide stereo image on its own; however, two can be set to operate as left and right channels for a traditional stereo setup. Via an optional bottom-connecting battery pack, the ARENA can also serve as a portable audio solution that’s splash proof and can play at 75dB for up to 20 hours on a single charge. The larger FESTIVAL retails for $499 and features an interior wood enclosure housing three woofers, three tweeters, and four passive radiators driven by 200 watts of power. Both the FESTIVAL and ARENA come in a choice of black with a titanium grille, or white with a silver grille. Although the speakers are available for purchase through the company’s website, RIVA also has a network of independent reps and distributors across the U.S., and has partnered with Azione Unlimited to assist in the launch.